To study the physical and chemical properties of atmospheric particulate matter over Dehradun city located along the foothills of the Himalayas, both in situ and satellite-based observations were utilized in the present research. Ambient respirable suspended particles denoted by PM10 (atmospheric particulate matter having an aerodynamic diameter of ≤ 10 µm) was measured during 2016–2017. The morphology and elemental characteristics of PM10 was studied through scanning electron microscopy (SEM) and SEM-energy-dispersive X-ray spectroscopy, respectively. The 24-h mean ± standard deviation of PM10 was observed to be 158.6 ± 33.4 µg/m3, which is more than 2 times the permissible limit of World Health Organization (50 µg/m3). Microscopic analysis revealed particles with irregular, porous, rounded, flaky, chain and branched structures indicating various types such as tar balls, soot, crystalline and biogenic particles. The frequently found particle types were investigated for the atomic percentage contribution, which revealed vehicular exhaust, industrial emission, biomass burning, and crustal/dust re-suspension as the chief source of PM10. To delineate the source and transport pathway of air masses converging over the city, 24-h air mass back trajectories were associated with MODerate resolution Imaging Spectroradiometer derived fire spots, geographical location of cement manufacturing and thermal power plants in the vicinity of monitoring site. Excess cancer risk due to inhalation of Lead particles (mean = 0.159 µg/m3) associated with PM10 was 0.16 × 10−6, which is well below the safe limit (1 × 10−6) framed by the United States Environment Protection Agency. The online version of this article ( https://doi.org/10.1007/s42452-019-0460-1) contains supplementary material, which is available to authorized users. The swift pace of urbanization and industrialization has contributed substantially toward the elevation of air pollution levels, especially in the developing countries. Atmospheric particulate matter (PM) considered as one of the criteria air pollutants  is diverse and complex to understand in terms of source, morphology, composition, size distribution, and mixing state . In India, most of the research studies on atmospheric PM have focused on the elemental composition of particles [3, 4, 5]. However, several researchers have investigated both the physical (shape and size) and elemental characteristics of atmospheric PM through scanning electron microscope (SEM) and SEM-energy-dispersive X-ray spectroscopy (SEM–EDX), respectively [6, 7, 8]. At the coastal city of Chennai, located in the south of India, SEM analysis revealed particle types such as soot, minerals and salts, whose origination can be traced to combustion, crustal and marine sources, respectively [9, 10]. In a densely populated city of Agra, located in the Indo-Gangetic Plains (IGP), SEM analysis revealed alumino-silicates, soot and tarball-type particles indicating contribution from construction, coal burning, and crustal sources . Similarly, at the metropolitan city of New Delhi, located in IGP, SEM analysis revealed crystalline, soot and flaky type particles indicating substantial contribution from vehicular, crustal and long-range sources . However, information on particulate morphology in the Himalayan region is scarce. Besides, morphological profile of atmospheric particles, information of chemical species associated with the particles can act as markers to identify the emission sources. For example, some common markers for vehicular emission includes copper (brake lining), zinc (tire wear), aluminum (wear of piston), iron (wear and tear of brake) and manganese (additives in unleaded gasoline) . Crustal/soil dust emissions are identified by tracer elements such as calcium, iron, magnesium, silica, manganese, potassium, sodium, lead, zinc, and copper . However, the elements emitted from industrial chimneys depend on the type of manufacturing processes. Over the last few years, numerous epidemiological studies have been conducted worldwide on finding the association between air pollution and human mortality . These findings reveal the importance of monitoring atmospheric PM10 especially in the data deficit regions. Moreover, it is well known that the exposure of carcinogenic heavy metals associated with PM10 can strongly induce carcinogenicity in humans . However, information of the atmospheric PM-associated elemental composition is scarcely available over complex terrains. Therefore, this research work was framed to fill a substantial part of this knowledge gap, thereby aiding in understanding the aerosol dynamics over urban-cities situated in valley-based complex topography. The objectives of this present study were to estimate the mass concentration of PM10, along with its morphology, source and health risks of atmospheric PM10. The atmospheric PM10 measurement was carried out at Dehradun city (30.28°N latitude and 77.99°E longitude) geographically located between the lower and Siwalik Hills (Fig. S1 of supplementary text). The city is situated at an altitude of 640 m above mean sea level with a total area of 300 km2 (https://dehradun.nic.in). Dehradun district has a population density of 549 persons/km2, and over the past decade (2001–2011), the population has increased by 32% along with a burgeoned increase in about 34 times in the total number of registered vehicles in Uttarakhand state (http://ueppcb.uk.gov.in/). The city is surrounded by dense forest comprising chiefly of Sal tree (Shorea robusta), and the climate is generally temperate. The city offers a lot of growth opportunities for people from surrounding mountainous regions . In order to accommodate the large inflow of migrants, the city has been undergoing a rapid expansion in urban spaces. Dehradun city was placed at thirty-first position in the list of top 100 polluting cities in the world . For measuring the atmospheric PM10, respirable dust sampler (Model No: SLE-RDS104NL, Spectro Lab, India) was operated at a flow rate of 1.1 m3/min controlled by a flow meter. The sampler inlet was placed at 3 m above ground level (AGL) to avoid any obstruction in air flow. Sampling was performed during the winter (November, December in the year 2016 and January of 2017) and summer season (March, April, and May of 2017). A total of 160 samples were collected with 80 samples from each season. The duration of sampling was 24 h, i.e., 6 AM on the first day to 6 AM on the next day (IST, Indian Standard Time). The EPM2000 grade glass fiber filter paper was desiccated for 24 h before and after sampling and weighted using an electronic balance (Model No: XS105DU, Mettler Toledo, USA). As a quality assurance and quality control measure, the filter papers were handled using forceps, transported in a sealed box and maintained in dust free condition during sampling and analysis . Moreover, a blank filter paper was collected every month during sampling period and the final results are blank corrected. During winter and summer season, the average temperature, relative humidity, visibility, and wind speed was observed to be 16.39 °C, 73.53%, 2.23 km, 1.96 km/hr and 24.60 °C, 49.33%, 2.79 km, 2.83 km/hr, respectively. The 24-h average values of meteorological parameters were acquired from weather underground (https://www.wunderground.com), and the results are furnished in Fig. S2 of supplementary text. The vehicular count was performed twice in week (once each during weekday and weekend). One-hour vehicular count was taken four times a day at 06:00–07:00 (HH:MM), 10:00–11:00 (HH:MM), 15:00–16:00 (HH:MM) and 21:00–22:00 (HH:MM). The obtained value was averaged, and the results from vehicular count are presented in Table. S1 of supplementary text. The collected information was subjected to statistical analysis through Statistical Package for the Social Sciences (SPSS, version: 16.0), and the level of significance was set at p < 0.05 for all the test performed. For determining the morphology of the particles, one filter paper was randomly selected for every 15 days. Thereby, monthly, two filter papers and in total about fourteen particulate-loaded filter papers were subjected to SEM analysis. A 1 cm2 portion of the filter paper was cut and coated with gold (Au) particles of thickness (15–30 nm) for 3 min using vacuum coating unit (Quorum Q150RES, Germany) for making it electrically conductive. Finally, it was analyzed with SEM (FE-SEM QUANTA 200 FEG, FEI Netherlands) available at the Institute Instrumentation Centre, IIT, Roorkee. The positioning of samples and imaging were controlled by a computer system . For SEM–EDX examination, we have analyzed those particle types that are frequently found in the filter samples. The occurrence frequency of a particle type was determined through SEM examination of the filter paper. Therefore, a representative particle from each type was tested for elemental composition through SEM–EDX analysis. 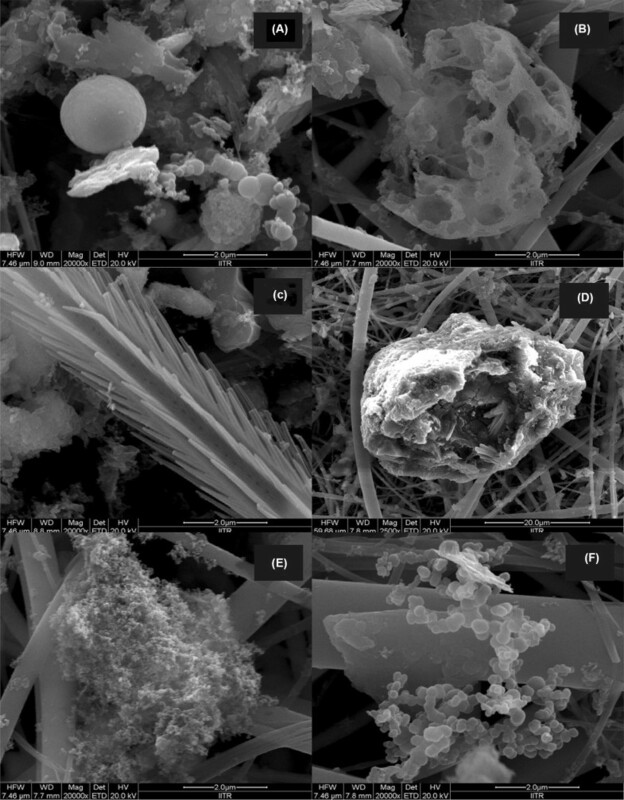 For this analysis, the filter papers were coated with carbon particles and subjected to a computer controlled field emission SEM–EDX (SEM laboratory, IIT New Delhi) equipped with RONTEC’s EDX system Model quanTax200 (resolution: 2.0 nm @ 30 kV, accelerating voltage: 0.2–30 kV, magnification: 5 × to 106 ×). As the filter sample is coated with carbon particles, the clarity of image is usually low. The spatial distribution of fire data during the study period was acquired from Moderate Resolution Imaging Spectroradiometer (MODIS) (https://firms.modaps.eosdis.nasa.gov/). The MODIS derived fire data uses one km channel at 4 and 11 µm wavelength. The shape file (.shp) of the fire data was acquired for graphical representation and comma-separated values file (.csv) was acquired for fire count data. Spatial distribution of gridded 1° × 1° Aerosol Optical Depth (AOD) map was acquired from National Aeronautics and Space Administration (NASA) visualization tool called “Giovanni” (https://giovanni.gsfc.nasa.gov/giovanni). Measurement of AOD is at 550 nm from MODIS carried aboard the Terra Satellite of NASA . To ascertain the impact of synoptic air masses on the atmospheric PM over Dehradun, 24-h air mass back trajectory converging at 500 m AGL was executed using HYbrid Single Particle Lagrangian Integrated Trajectories (HYSPLIT)  through Trajstat software (version 1.2.2.6) . The trajectories were generated at 00:00 (HH:MM, Universal Time Coordinate). In cluster analysis, similar trajectories are averaged and the mean air mass back trajectories are visualized, thereby errors in the individual trajectories likely get balanced out. The clustering algorithm is based on Ward’s hierarchical method, and Euclidean distance was selected as the cluster model. The meteorological data necessary for computing the trajectories were obtained from NCEP/NOAA global reanalysis data (ftp://arlftp.arlhq.noaa.gov/pub/archives/reanalysis). The detailed information of executing air mass back trajectories and generating cluster analysis of air mass back trajectories are discussed elsewhere [24, 25]. where C represents concentration of the lead (µg/m3), ET represents the exposure time (12 h/day), EF is the exposure frequency (184 day/year), ED is exposure duration (24 years), and AT is average time for carcinogen (AT = 24 h/day × 70 years × 365 days). The mean ± standard deviation of PM10 mass concentration in the winter and summer season was observed to be 174.5 ± 20.70 and 142.6 ± 36.24 µg/m3, respectively. The overall range and average of PM10 mass concentration was observed to be 85.6–226.9 (minimum–maximum) and 158.6 ± 33.48 µg/m3. Monthly, seasonal and weekly variation of PM10 mass concentration is represented in Fig. 1. Independent sample student t test (assuming unequal variance) revealed a significant seasonal difference in the PM10 mass concentration during the study period (t-statistics = 6.83, t-critical = 1.97 (two-tailed), p < 0.05). High concentration of PM10 in winter season can be attributed to the increased anthropogenic activities such as biomass and fossil fuel burning and meteorological parameters such as low wind speed, low planetary boundary layer and high relative humidity that can lead to a reduced rate of removal of atmospheric PM through scavenging effect . The geography of the study site corresponds to a saucer-shaped valley, where dispersion of pollutants is low. Moreover, only during seven percentage of the sampling days in the entire campaign, the 24-h mean PM10 mass concentration was less than the permissible limit of national ambient air quality standard (100 µg/m3) framed by Central Pollution Control Board (CPCB), whereas none of the sampling day showed concentration less than World Health Organization’s standard (50 µg/m3). 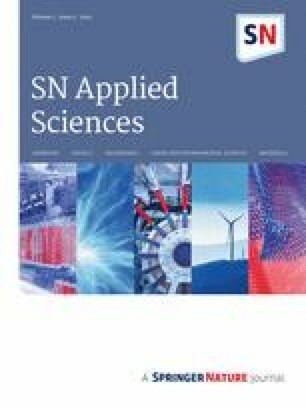 On comparing the results obtained in this study with other studies around the world on cities situated in a valley-based topography, it was observed that the 24-h average mass concentration of PM10 observed at Doon valley was higher than that reported in Kathmandu valley, Nepal (127.70 µg/m3) , Lanzhou valley, China (111.53 µg/m3) , Piedmont region, part of Po valley, Italy (58 µg/m3) , and Mexicalli valley, Baja California (54.5 µg/m3) . In the present study, approximately 28% of the sampling days were weekends (Saturday and Sunday) and 72% were weekdays (remaining days of the week). The 24-h mean PM10 observed during weekends was 148.39 ± 35.5 µg/m3 and during weekdays was 162.58 ± 31.9 µg/m3. The vehicular density observed during the weekday period was 23% higher than weekends. This points toward the effect of vehicular traffic on the atmospheric PM10 mass concentration at Dehradun. On employing kurtosis test to the PM10 mass concentration data, it revealed a negative value (kurtosis = − 0.72), demonstrating a Platykurtic distribution of data (flatness of distribution of data) . This distribution indicates the absence of any substantial episodic pollution event during the sampling period. Several episodic events common in India are Diwali and Holi festival. 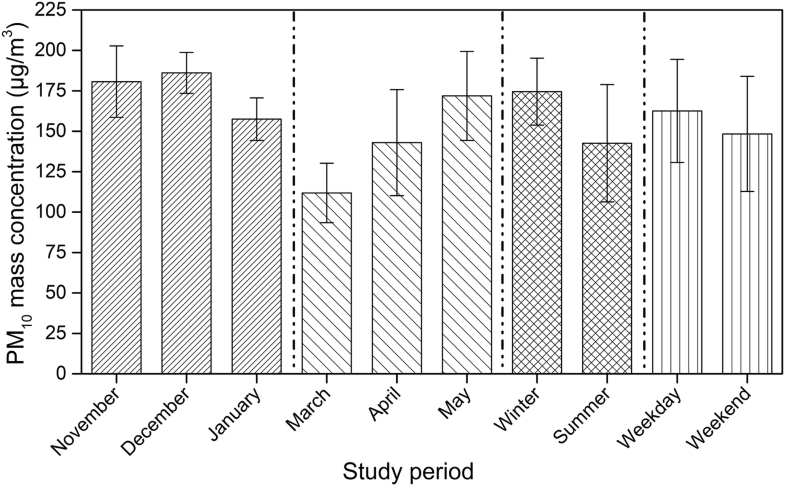 In the present study, PM10 sampling was avoided during harsh weather conditions and festival periods. Microscopic analysis reveal that the particles were mostly irregular, crystalline, smooth rounded, porous and chain-branched structures indicating various types such as tar balls, soot, biological particles, etc. (Fig. 2). Figure 2a represents tar balls. The tar balls are identified by their spherical and amorphous structures, and it usually does not aggregate with other particulates . Tar balls are mostly emitted from the incomplete fossil fuel burning and biomass burning. The presence of tar balls can adversely affect the scattering and absorption of light effectively and can play an important role in climate forcing and regional haze . Porous particle is represented in Fig. 2b. The origin of these particles can be attributed to the agricultural/forest burning and waste incineration. Earlier, research in morphological analysis indicates that the porous particles are rich in carbon and also has the potential to facilitate deposition of other particles leading to complex structure [9, 31]. The biological particle shown in Fig. 2c can occur due to the presence of pollens, fragments of leaves, algae, bacteria and protozoa. Also, the fragments and excrements of insects can be considered as a biological particle. Figure 2d represents an irregular particle, which can have wide variety of source and particle composition. Earlier studies in Indian region have revealed that the irregular shaped particles can be quartz, alumino-silicate, iron, chloride, and calcium-rich particles [6, 39]. Soot particles are shown in Fig. 2e, and chain/branched particles are shown in Fig. 2f. These particles are chiefly contributed from fossil fuel combustion and can be easily identified by their unique structure ranging from linear to more complex branched aggregates of particles. Their origination can also be traced to coal-burning industries and power stations involving high-temperature process . Through SEM examination, the frequently found particle types were of irregular, flaky, smooth edged and crystalline nature. A representative particle from each type was selected and analyzed for its respective chemical composition through SEM–EDX. 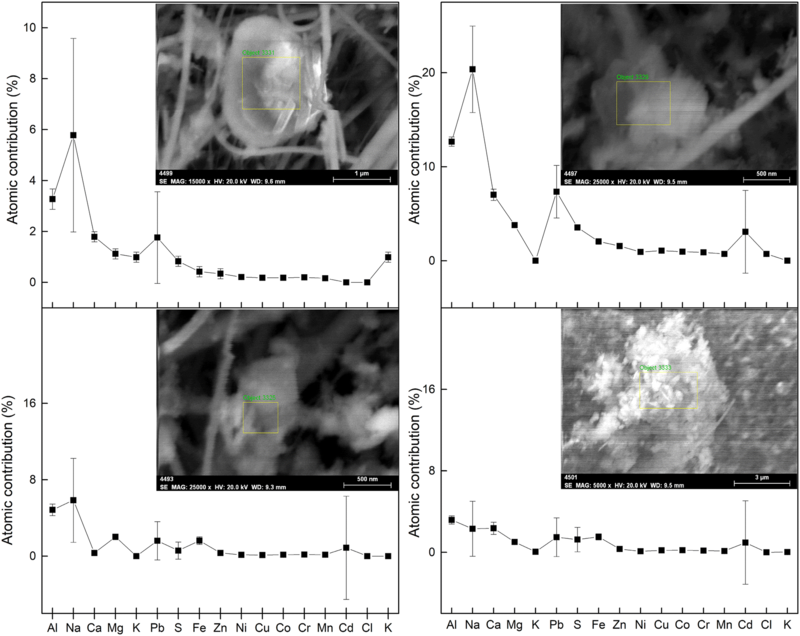 The results from SEM–EDX analysis of four individual PM10 particles are presented in Fig. 3 along with the respective atomic percentage contribution. The results reveal the presence of lead (Pb), cadmium (Cd), aluminum (Al), sodium (Na), calcium (Ca), iron (Fe), sulfur (S), zinc (Zn), magnesium (Mg), copper (Cu), cobalt (Co), nickel (Ni), chromium (Cr), manganese (Mn), chlorine (Cl), carbon (C) and potassium (K). The atomic percentage contribution of Si and O was high in the blank filter paper (Fig S5 of supplementary material), therefore, it was not considered. For ease of understanding the source of these elements, the atomic percentage contribution of chemical species associated with four particles subjected to SEM–EDX test were averaged and the results are furnished in the text below. The percentage contribution of Carbon (16.06%) was comparatively high, which can be attributed to the heavy vehicular traffic . The presence of elements such as Pb (3.05%), Cr (0.36%), Zn (0.64%), Cu (0.39%) and Fe (1.41%) can be attributed to vehicular exhaust emission. The Cd (1.23%), Co (0.38%), Mn (0.30%), Ni (0.35%), and Al (6.00%) can be from the brake and tire wear [12, 41], while the presence of Na (8.58%), Ca (2.88%), Mg (1.99%), and Cl (0.19%) can be attributed to road dust re-suspension [12, 39, 42]. Further, high contribution of Pb (3.05%) in the samples can be attributed to high vehicular movement. The local sources of Pb can be attributed to the tire wear, burning of electronic and plastic waste [43, 44]. The leaded petrol which was banned from usage before a decade, however, can exist along with the road dust for a long time , the road dust particles get re-suspended due to frequent movement of vehicles. Moreover, in an earlier study, elevated concentration of Pb was reported near a cement plant in the state of Chhattisgarh, India . Long-range source of pollutants over Doon valley can be established owing to the presence of Sulfur (1.55%). Sulfur is chiefly emitted from coal-based thermal power plants . The location of coal-based thermal power plants situated along the vicinity of sampling site was acquired and presented in Fig. 4. In addition, the air mass pathway trajectories were merged with the respective figure to investigate whether the air masses converging over Dehradun passes through these potential source regions. Detailed discussion on this portion is mentioned in Sect. 3.5. The presence of aluminum (6.00%) can be attributed to the industrial activities like manufacturing of Al vessels, pipes and connectors, and emissions from industries in the form of fly ash . The complex structure observed in Fig. 2e may have been triggered by high-temperature combustion processes, which is common in manufacturing industries. These results suggest that the air quality over Dehradun can be substantially influenced by the anthropogenic activities such as industrial and vehicular movement. Among the anthropogenic originated elements, high atomic contribution of Pb (3.05%) prompted us to quantify the mass concentration of Pb in PM10 samples. The Pb was quantified by subjecting the particulate-loaded filter paper to Atomic Absorption Spectroscopy (AAS). One filter paper per week was selected for the analysis, therefore in total, about twenty-seven filter papers were subjected to AAS analysis. The methodology used for quantification was according to Shridhar et al. . The step-wise protocol followed for the analysis and obtained results are described in brief in the supplementary text. The mean concentration of Pb associated with the atmospheric PM10 samples collected during the study period was observed to be 0.159 µg/m3 (Fig. S6 of the supplementary text). Therefore, the ECR due to inhalation of atmospheric Pb was observed to be 0.16 × 10−6, which is well below the safe limit of 1 × 10−6. For public health protection, the United States Environment Protection Agency has recommended the safe limit of ECR value to be one in a million (1 × 10−6) . Impact of biomass burning/forest fire on the air quality of Dehradun can be substantiated by the presence of K in all the four particle types. The presence of K (0.26%) in all the analyzed particles tempted us to acquire MODIS derived fire data and aerosol optical depth around the vicinity of the sampling site, as it is well known that the presence of K in the atmospheric PM denotes substantial contribution from biomass burning [2, 49]. Figure 4 reveals high fire counts around the sampling site, which points to the extent of how biomass burning emissions can influence the air quality of Dehradun city. Moreover, in India, the monthly fire counts reported during the study period followed the order of April (5214) > March (5174) > May (1260) > November (1143) > January (474) > December (284); month (fire counts). High fire counts during summer season is due to crop-residue burning in IGP and forest fire in the Himalayan region , while fire counts during November is chiefly attributed to the crop-residue burning in the north-western IGP . The pollutants released from these locations can travel to far end places through long-range transport. In a comprehensive study, Rupakheti et al. reported that open fire in IGP region during pre-monsoon period lead to a surge in pollution level at Lumbini, a famous tourist site located near the northern edge of central-IGP. However, in this study, we are reporting the influence of emissions from IGP and Himalayan region over Dehradun city, which is located near the foothills of the Himalayas. In support of the earlier results, the spatial distribution of aerosol optical depth (AOD) derived from MODIS-Terra satellite reveal seasonal difference. During winter season, there is an increase in the biomass burning over IGP region and so higher AOD was observed (Fig. 4). Likewise, during summer season, the mountainous region in Uttarakhand shows an elevated AOD which can be chiefly attributed to the forest fire . Previous studies indicate that emissions from forest/biomass burning are one of the chief sources of soot and tar balls in the atmosphere . Furthermore, earlier research shows that people in the state of Uttarakhand depend mostly on the fuelwood for cooking, so the region has higher consumption of fuel wood (average: 1.50–2.50 kg per capita per day) compared to the central Himalayan region (1.49 kg per capita per day) [52, 53, 54]. Therefore, apart from forest fire burning emissions, fuelwood can also influence the air quality in the surrounding region. An earlier study revealed that the PM estimate from biomass fuel is about 8.61 ± 4.54 Gg/year, which is higher than several north Indian states . In the earlier section, the biomass burning, cement and coal-based thermal power plant emissions were presumed to play a substantial role in influencing the air quality of Dehradun. However, it is recommended to have a detailed knowledge of the pathways traversed by the air masses converging over Dehradun. Therefore, air mass back trajectory analysis was performed to investigate whether the air masses converging over Dehradun city is influenced by forest fire/biomass burning, emission from the coal-based thermal power plant and/or from cement industries in the vicinity (Fig. 4). Trajectory cluster analysis indicates that the air masses have its source mostly from north-western direction from Dehradun city. To represent the predominant direction of air masses, four number of clusters (A, B, C and D) were generated from the 24-h air mass back trajectories for winter and summer season. In the course of winter season, clusters B and D represent 26.1 and 6.5% of the trajectories each; these trajectories had long-range sources from the northern part of India. Cluster A and C representing 26.1 and 41.3% of the trajectories originate from the Indo-Gangetic Plains (IGP), where high fire counts was observed. Also, IGP has high number of cement and coal-based thermal power plants. Therefore, it can be mentioned that the air masses from cluster B and C can have greater influence on the air quality over Dehradun. In the summer season, trajectories were mostly from north-western direction from the receptor site. Cluster A and C sharing around 33.7 and 30.4% of the trajectories originated from north-western IGP, where large quantity of agricultural/residue burning are reported. Moreover, earlier studies have reported that these regions are dotted with many industrial hubs  and hundreds of brick kilns located in these regions release higher quantity of emission due to poor technology used in the manufacturing processes . Cluster B and D representing 7.6 and 28.3% of trajectories originate from central-IGP. Microscopic analysis reveal that the morphology of particles were mostly irregular, smooth rounded, flaky, porous and chain-branched structures indicating various types such as tar balls, soot, crystalline, biological particles, etc. SEM–EDX result indicates that the atomic contribution of anthropogenic (Pb, Cr, Cd, Cu, Co, Zn, Mn, and Ni) and crustal/soil (Na, Ca, Cl, Al, Mg, Fe, and K) elements were 22.1 and 77.8%, respectively. This indicates that the road dust re-suspension, vehicular exhaust, and industrial emission play a considerable role in air quality degradation over the city. 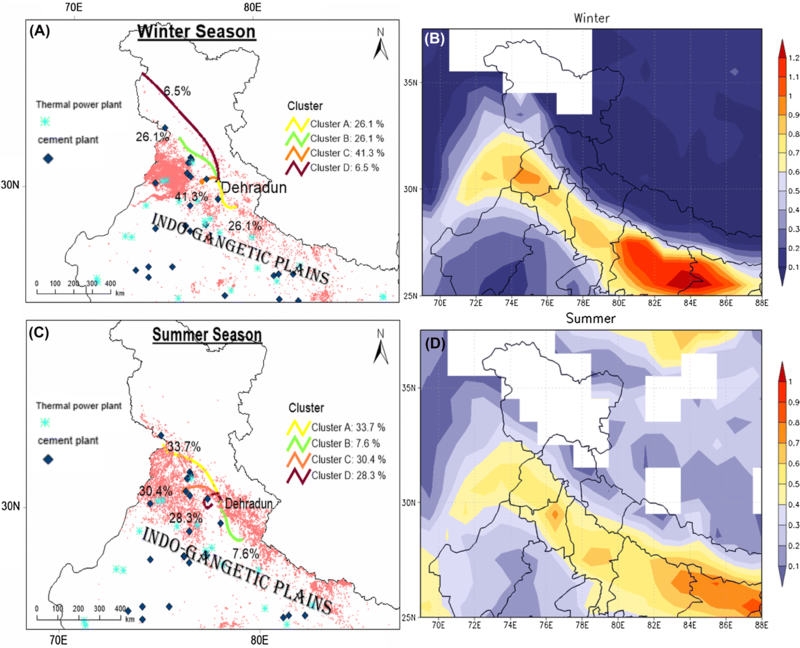 Trajectory cluster analysis reveal that the source and transport pathway of air masses were mostly through the IGP and Indo-Himalayan region. The forest fire and aerosol optical depth maps indicate that the IGP region has high frequency of biomass burning activities during November, while Himalayan region has high frequency of forest fire during April and May. The emissions from these burning activities influence the air quality at Dehradun. Moreover, it is possible that Dehradun may be influenced by emissions from the coal-based thermal power plants and cement industries situated in its vicinity, as the air masses converging over Doon valley traverse across locations where several industrial hubs are situated. The excess cancer risks due to inhalation of atmospheric Pb associated with PM10 was observed to be 0.16 × 10−6. The results from this pioneering study will be helpful in understanding the aerosol dynamics over an urban valley like Dehradun. In future, sampling of atmospheric particles can be carried out using non-fiber based filter material so that in-depth morphological analysis through image processing software is possible. We are thankful to the University Grants Commission for providing fellowship No. F.17-170/2014 (SA-1) to Vignesh Prabhu.